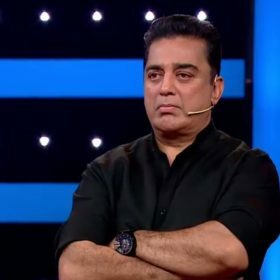 Bigg Boss announces two new games to help the contestants double their points. In an attempt to enter the red room and unlock the locker, Harish and Arav wake up during the night. However, their attempt fails when they see Snehan and Ganesh sleeping on the floor preventing the devils to enter. Arav and Harish then decide to tease Suja, in the presence of Ganesh and Snehan. When Suja requests Arav to stop teasing her as she wants to draw a ‘kolam’ and dedicate it to her fiance, Arav doesn’t allow her to do so. Suja tries to sit on his lap. In turn, Arav gives her a gentle kick twice and when she reacts, Harish reminds her that angels are supposed to keep calm and not react. After the wake-up call Arav, Harish and Bindu plan on locking the angels in the bathroom to achieve their goal, when Harish reminds Arav that Ganesh is physically stronger than them and can prevent them from doing so, Arav responds by saying he’s ready to face it. Arav and Harish continue to tease Suja. First Harish blocks her from taking the food sent by Bigg Boss. Later, Arav tells her that as an angel, she is incapable of keeping her white robe clean. He also asks her to massage his leg and tells her that if she does a good job, he’ll stop troubling her. He also tells her that she’s a perfect angel but carries a bit of arrogance. Then the devils team up and try to enter the red room while the angels prevent them from doing so. During the attempt, Snehan blocks Harish while Ganesh tries to grapple Arav and succeeds in doing so. Arav then tells his team members to give up the fight. He also tells Ganesh that the angels aren’t playing the game well. Suja gently pushes a bag containing Harish’s clothes with her leg and in a fit of rage, Harish pushes the iron stand. Later, Arav tries to exit the room and unintentionally pushes a chair on Suj, leaving her hurt. In the next twist in the tale, Bigg Boss orders the devils to play the role of angles and vice versa. When the game begins, Suja and Arav get into an argument. Arav insists that Suja should exit the red room, in response to his statement Suja tells him to start addressing her with respect and also tells him that women need to be respected. In return, Arav tells her that he’s been very casual in the way he speaks to her and also tells her that if she needs to be respected that way, he will stop talking to her. Snehan then takes the key to the locker, while the angels prevent him from entering the red room. The devils try to annoy the angles by spiling sambar on their robes and dispersing their clothes. Snehan secretly enters the bathroom and hides the locker key in a mitten. Later, Ganesh pushes away Arav to successfully reach the locker and open it. The angels – Arav, Bindu and Harish give up. After the game, the housemates begin cleaning the house and Harish tells Snehan that during the task Suja stained his white shirt and that she should wash it for him. Suja tells him that she will do it only if Bigg Boss tells her to. Ganesh and Snehan discuss that Bigg Boss would never take a stand on this, and will only ask them to tackle it on their own. Harish tries to explain to Suja, that the task is over and that she can relax. He also tells her that she usually doesn’t calm down after a task is done, so much so that she didn’t speak to Snehan after they had a fall out during their previous task. She tells him that their equation is different and asks him not to interfere in it. In the meantime, Arav, Bindu and Harish discuss that Suja’s character is never consistent. They also discuss that Ganesh has been consistent throughout while Snehan becomes upset when something affects him. Bigg Boss introduces a new game to the team wherein the housemates need to play in two teams. The housemates need to play a game of bowling ball, and then blindfold a member of the team and see to that he pins the tail on the elephant. Bindu pins the tail perfectly and her team consisting of Snehan and Arav emerge victoriously and bag a trophy. After successfully winning the devils vs. angles task Bigg Boss awards Ganesh, Suja and Snehan 20 points and bonus 5 points for being patient throughout the task. 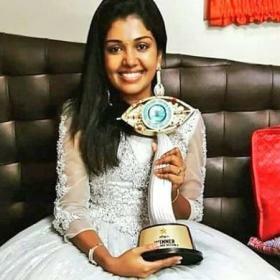 I appreciate Suja’s effort and eager to win.. Not like other keep gossip and not take as game. Even her action like irratating but far better than Julie n gaya3. Arav kick her few times but she not agree. Bindhu geng keep throwing garbage but she still cleaning. But when she do according given task the house members scold her. It is not fair for Suja. I think her group extra 5 points because of her. I see another face of her, seeking attention.. It could be her family background. We must see this as game like how other reality games. Good competition must be with snegan, ganesh, Suja, last can be Arav. Other 2 pls go back n rest at home. Pls give chance to a person hungry for winning..